Hi everyone. I hope your weekend started great. I am having some flu symptoms but nothing very serious until now. After a dense and a busy week at work combined with a short trip to Dusseldorf for an event (more about that later), I am more than ready to relax a little. The semester will be over soon, I have to treat myself to something after that, will have to think about it. Any ideas? 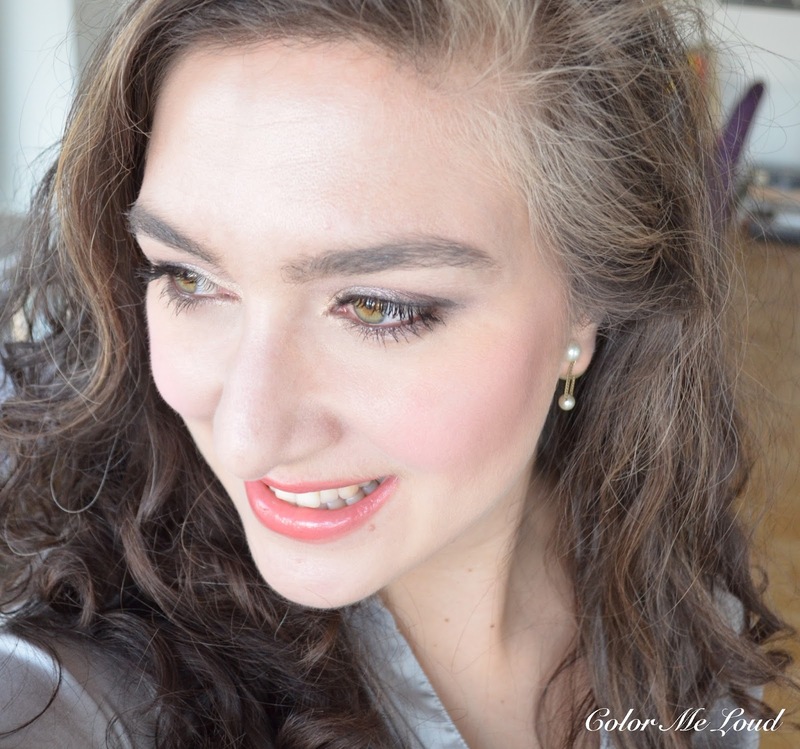 I have been playing with Suqqu Spring Collection for some weeks now but my FOTD shots are slow. When I drive to work in the morning, it is dark. When I come at night, it is dark again. I am an avid believer of FOTDs by daylight since I don't like to wear tons of make-up and lights wash everything out. Don't get me started with all the Instagram mask and brows trend. Today I would like to post some swatches and thoughts now about Blend Color Eyeshadow Palette 22 Kikyoutsubomi, Ex-28 Kinshasuna, Face Color Palette Ex-04 and Bright Up Lipsticks 08 Sumidaidai and 09 Azamibae. I will follow this post with a more FOTD heavy second post. Tokyo in Springtime is the inspiration behind this collection. Last year it was really magical to be there during cherry blossoms. This year we are still trying to figure out if there is a little time in the beginning of March to do it again. 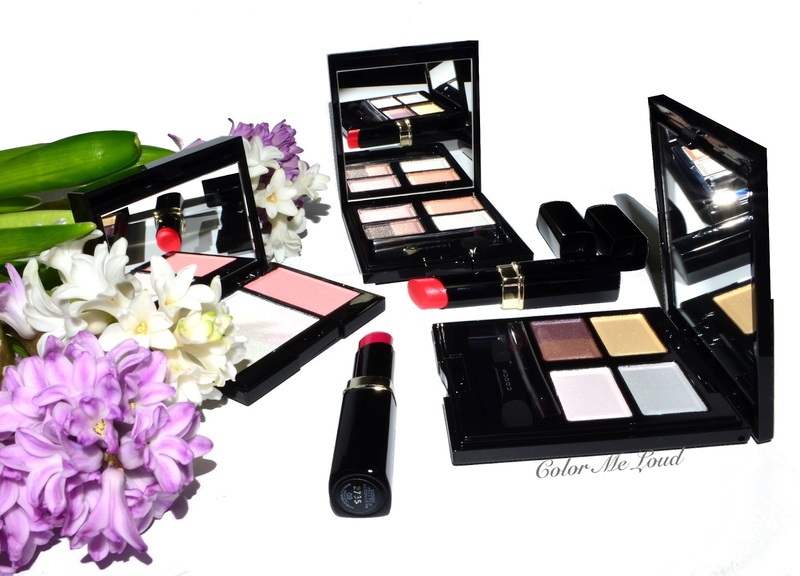 Suqqu Spring 2016 Collection includes two new Blend Color Eyeshadow Palettes (quad) and two Eye Color Palettes (trios). I have been wearing the Blend Color Eyeshadow Palettes for a couple of weeks and this week I started to test the trios. I will review and swatch the trios in the next post. 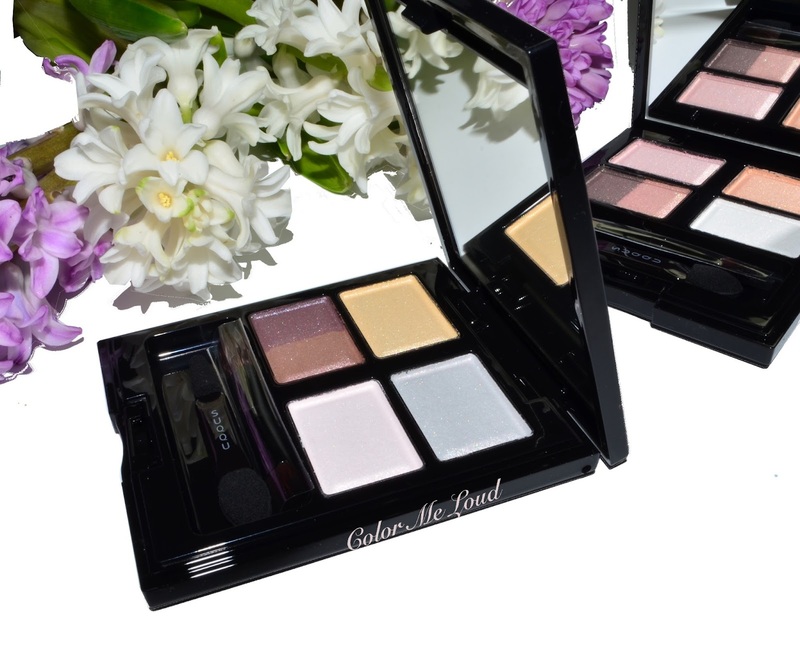 Both of the Blend Color Eyeshadow Palettes in this collection have natural pastel shimmery hues which doesn't look too pastel once worn on the eyes due to their soft pigmentation. The base shade (bottom left) is not a cream like the Fall 2015 quads, but instead it is a powder. The lasting powder of Suqqu is phenomenal, they blend like a dream. I wore only Suqqu since two weeks and I was thinking that the western high-end brands have so much to learn from these textures and formula. Suqqu Blend Color Eyeshadow Palette 22 Kikyoutsubomi is a much softer take-on to Sakura theme than last year's quad, #18 Sakuraori (reviewed here). I have shared with you before that Sakuraori has been my all time favorite Spring Eyeshadow Palette but I have been enjoying the natural polished look Kikyoutsubomi gives me. It is less pink and warmer on the eyes than Ex-25 Haruhinata (reviewed here). If you like warmer shimmery naturals with a touch of pastels, you will love Kikyoutsubomi. My highlights of this quad is the split pan cool taupe color. Once the cool brown is mixed with the pink, it reveals a very complex beautiful taupe which can be worn on its own for full satisfaction and need nothing else. The other highlight is the peachy golden shade, which sets this quad from last year's. It is such a wearable and unique peach. I wore this one multiple times but couldn't manage to shot an FOTD with enough light to show its beauty, but it will be included in the next post. Meanwhile, please take a look at Belly's post here. Oh and not to forget, I need to check the meaning of Kikyoutsubomi, which consist of the words tsunami (蕾) buds, unopened flowers, ki(輝) radiant kyou(杏) apricot, so my guess is here radiant apricot buds which explains the beautiful peachy gold shade (apricot). As Kikyoutsubomi gives a nice feminine polished look, I am digging the limited edition quad, Suqqu Blend Color Eyeshadow Ex-28 Kinshasuna the most. The name kinsha (金紗) suna (砂), I believe, suggests sand-washed sand crepe fabric. Although I can understand that the reflections of the textures are really suggesting that, I would personally call this quad "the white frost on a spring bud". The combination of yellow with very soft pastel blue and purple is breathtaking. I think Kinshasuna is one of the must-haves of this collection. Especially if you are a Suqqu fan and like wearing cooler tones on the eyes, don't miss this beauty. Because I can't get enough of it, here is another shot, from an angle you can see the shades much better. The icy blue is nicely neutralized with the gorgeous yellow. That gorgeous yellow, can we talk about it? I don't have anything like this one in my collection. It is not gold, not very pastel, just right. I am wearing it in the eye look below on the inner corner. I applied the blue on the middle and purple on the crease. If you can't pull off a baby blue, you should try Ex-28 Kinshasuna and get surprised. In Spring Collection, another icy beauty is the new Suqqu Face Color Palette which includes two brushes on the top tier, a color correcting powder and a blush combination on the second. The brushes which come with the compact are useful for touch ups. They are made of natural hair, I believe it is squirrel. They are nicely soft although not as soft as by full-size Suqqu brushes, I promise it will be softer than all your Chanel, Dior, MAC and similar brushes *chuckles*. One of the brushes is smaller and has an angle. I believe that one is aimed for the blush and the other one is for the powder. Yay for two touch up brushes instead of one. Once put the brush in the blusher and if you would like to use it for your powder afterwards, you end up getting the blusher all over the face, not a good idea. It is great to know that luxury is all about the details and Suquu get you covered. Here is a close up of the Face and Cheek Color Palette. 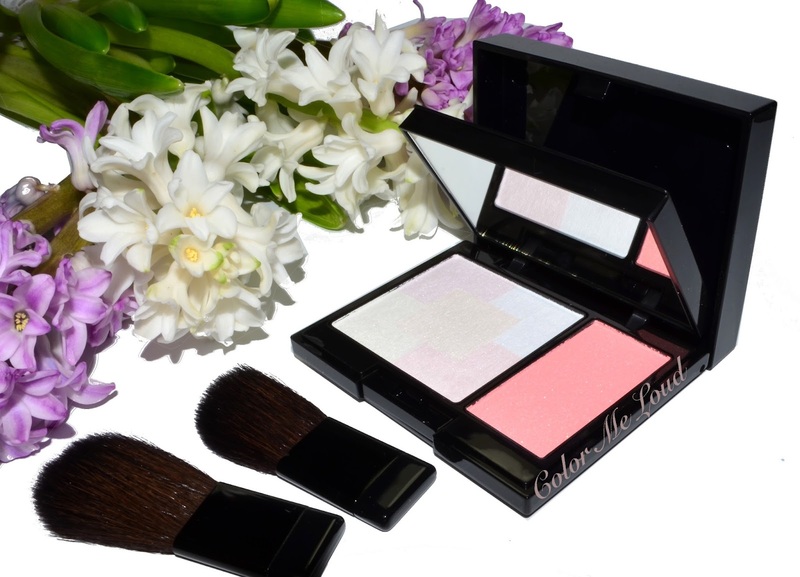 The soft shades on the face powder gives a soft focus and color correction for the face. The blush is very soft and shows up on my NC20ish skin just right but I suspect starting from medium complexions, it would be more like a brightening or highlighting product. The powder is very finely milled and very soft to touch but it is not powdery. It kicks up some powder once you dip your brush in there but it blends like butter on the face. It doesn't look powdery on my dry complexion but I can see that it has some mattfying touch too, probably due to Talc. The powder has silica listed in the ingredients which explains how light it is. 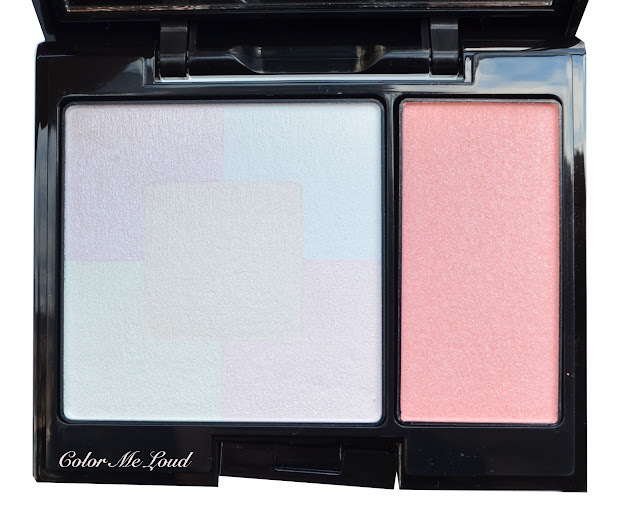 It is not a purely silica based powder but a cross between a finishing and a setting powder. On another note, the ingredients list is really impressive, including Jojoba Seed Oil, and Squalene. There is 6.1 g of product in the compact. Lastly there are two new Bright-Up Lipsticks which will join the permanent line. 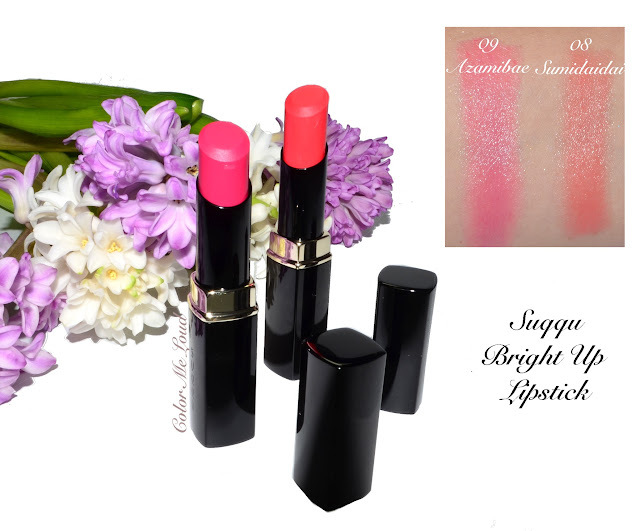 I am a fan of Suqqu Creamy Glow Lipsticks, they last so well on me while giving a shiny natural finish. This was the first time I tried Bright-Up Lipsticks and I am impressed. I think these two are the other two highlights of the collection. 09 Azamibae is a natural pink, 08 Samidaidai is a understated coral. These are so glossy, almost look like a gloss on the lips but they are not sticky. They have a certain transparency but enough color to them. They don't last as long as Creamy Glow Lipsticks but they make the lips look so full and the lips feel very hydrated, I am a fan. I love both of the shades and the formula, definitely recommended. Here is a look I managed to capture despite the lack of sun during the last weeks. I am wearing Suqqu Blend Color Eyeshadow Ex-28 Kinshasuna on the eyes, Face Color Palette Ex-04 on the face and cheeks and Bright-up Lipstick 08 Sumidaidai on the lips. Final thoughts: Suqqu's beautiful textures and formula is combined with very soft, feminine and natural to pastel shades for this spring. I am especially loving the new Bright-up lipsticks. Both of the eye shadow quads are superb in quality. 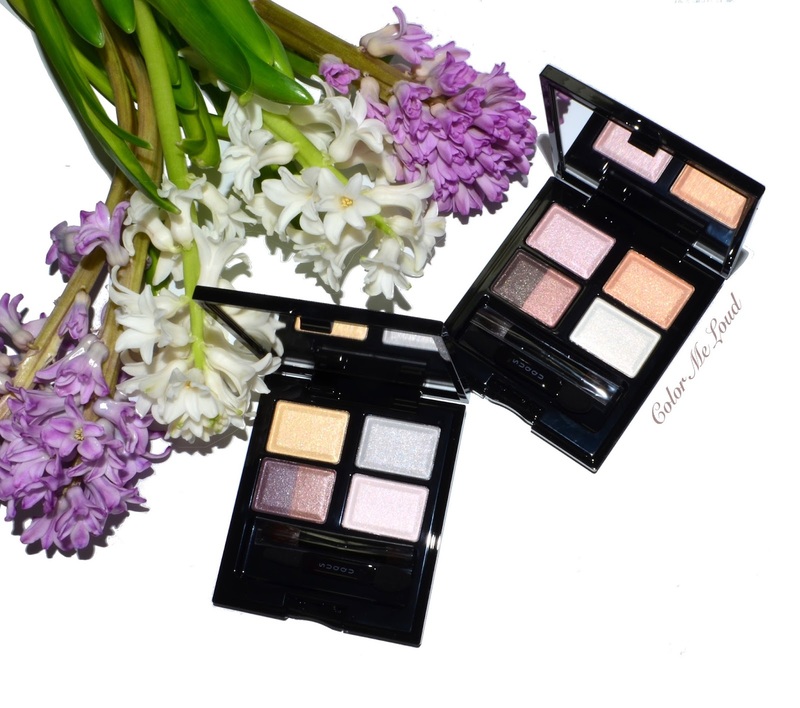 If you are fair or you like your eyeshadows to be softly pigmented you will enjoy both of the quads. My favorite is the unique combination of icy blue and yellow in Ex-28 Kinshasuna. The collection will be available in February. Suqqu is available on store at Fenwick of Bond Street, Harrods and Selfridges and online at Selfridges and Harrods. Does anything catch your eye? Wow, was für eine tolle Kollektion! Mir gefällt jedes einzelne Teil! Schade, dass ich sie in London nicht gesehen habe. Hi Sara, thank you for your review. I am very tempted by everything and I will definitely be getting Ex-28. It looks beautiful on you. Would you say the face powder gives a similar effect to Meteorites? Is it slightly pink or more white? I have some redness so I'd prefer something to correct the redness rather than make me more pink :). Really want one of these, but I can't decide which. I got the one from the fall collection with a red in it and it blew me away. I didn't know eyeshadow could be like that. Wimpers... This collection is so beautiful! My Dear Husband leaves for Tokyo the last Friday in January. Wonder if these will be in store by then. If not we have an anniversary trip we were planning to take, once I decide between two cities in Europe or two cities in Asia. But that probably won't be until March or April. Sigh. I wish Suqqu was readily available in the US. You are so right. I was testing Suqqu for the last two weeks. I was wondering what went wrong with eyeshadows of brands like Dior. Seriously, there are light years in terms of texture, bledability and longevity. The other one from the fall collection with green, that one is so good for green eyes. I would go for that one if I were you. It has a plummy tone in there, to die for! I think these will hit the counters sooner in Japan than they do in London so probably he can get you some of these. I am also considering to visit Japan again this year, if I can. It is always so refreshing to be there and the food, OMG, so good! Do you like Japanese food too? this is such a lovely command, thanks for it. I got the pink highlighter, one of the eye shadow sticks and all the nail polishes from Dior. I might check out the eye shadows but I don't like their formula and the shades are not calling me so I might pass on these. I will try to play with everything on Monday and post as soon as I can. I have to yet try out the eyeshadow stick but I can already say highlighter is phenomenal, I might get the golden one as well. Nail polishes are nice too. Is there a product which particularly interests you? Frühlingskollektion kommt erst in Februar raus. Die Farbe sind in der Tat sehr schön, sehr zart und natürlich. They just melt into the skin! As I´ve previously mentioned, I work part time in a store selling cosmetics, and I can tell you there is nothing available through that chain that can even compare to Suqqu e/s. Not even Japanese brand Sensai by Kanebo. They've also become a favourite of mine with regards to eye liners, so if I am to pick up any el´s this year it´s going to be a black gel liner from Suqqu. I love the soft glow of this collection. I think I'm going to have to pick up a trio next. I checked the Japanese Suqqu site and these are already listed, so I'm going to assume they will be in the Japanese stores soon. Either way the DH will be in Tokyo for at least two weekends, so there is plenty of time to send him on a shopping mission. I love Japan. Yes, I really love Japanese food, too. It's so much healthier than American food. Really wish I could spend more time there. So many places I'd like to travel to, so little time. Sara, the EX-28 looks gorgeous on you! I am actually debating DIOR 001 Glowing Pink Illuminator vs. SUQQU EX-04 Face Palette...since you own both, which one would you recommend more / is superior / more phenomenal to splurge on? My skintone is around NC15. Thanks in advance! Dear Sara, thank you for your prompt reply. I have been considering the two highlighters, Hortensia, Twig and Iris eyeshadow sticks, Bluette Polish and Blue Garden quint. It's great to know you like the pink highlighter, I'll definitely be ordering this when it launches here on Wednesday. I've seen your polish swatches on IG and I do like them both. My biggest doubts are with the Blue Garden as I know Dior eyeshadows can be a bit hit and miss. Anyway, thanks again and I look forward to your reviews of both Suqqu p. 2 and Dior. Would you say that the Suqqu powder is similar to Meteorites and if so which do you prefer? Thank you. Super-excited to the see the cool eye palette. I always hesitate because it's not cool enough. And yet just placed my Suqqu first order with Selfridge. Was not feeling the Christmas palettes so went with brushes and eyeliners. You are lucky then about the collection. Love the shopping mission idea. Last time hubby got me some items from San Francisco, one of them were sold out so he managed to find another store, I was so impressed. I think I will give the quint a miss, I was not very lucky with the Dior Quints last year, enough money spent. Pink Highlighter is very good. I am considering to get the golden one too although pink one is better for my skin color. Suqqu Powder is very similar to Meteorites. I like Suqqu one more because it is less pressed, easier to pick up. I will also review the new Meteorites powder soon, it is stunning as well if you use a denser brush. I hope I can write the review tomorrow night or Tuesday night. If you once dive, you can never go out lol, just warning. yes soft glow it is. I like using the base shades from Fall Quads to make it pop a little more. I need a pot of these cream bases lol. The two products are different Dior 001 Glowing Pink is a highlighter, Suqqu Ex-04 is a all over finishing powder + a blush. Depending on this one you need, you can pick one. If you ask about which one is superior, I would say as a highlighter it is Dior but as a color correcting powder, Suqqu one is really nice. Would you say Suqqu powder is good at correcting redness (even if it's just slightly) or does it have a slightly pink cast? Thank you. The eye palettes aren't doing it for me unfortunately. I love the looks of the lipsticks though. So pretty! I don't have much redness but this one is not pink, it has similar concept to Meteorites with a much silkier powder which is easier to pick up. It doesn't have a pink cast, more of a whitish cast. I am about to review the new Meteorites and I also swatched this one against the other shades. Please give me a day or two. Oh, I love the palettes and your look, Sara! I also need both trios. What a collection - lots of light and neutral (not too warm/cool) tones !!! Who knows when suqqu will launch something like this again. I am sceptical about these two lipsticks though, because I am afraid they will look too light and almost neon on my dark lips. Also I should have some similar ones from Chanel Coco Shines and Dior Addicts. Ohhh so pretty Sara!! I had completely written off both palettes, but you've made me rethink EX-28! !